If a 'vacation of a lifetime' or 'amazing honeymoon' in Aruba is top of your list, then Exceptional Villas has the expertise and creativity to build a bespoke trip, like no other, to this magical island. You may have some ideas of what you want from your trip: exclusivity, glamour, decadence, romance, privacy … we take all of your wishes and spin them into glorious reality. Our Aruba team have identified the most exceptional Aruba villas and luxury Aruba Vacation Rentals. We have contacts and connections on the island on standby to deliver your dream vacation. Prepare to have all of your expectations met and exceeded. The moment your flight touches down in Aruba, your comfort, happiness and pleasure are our priorities. 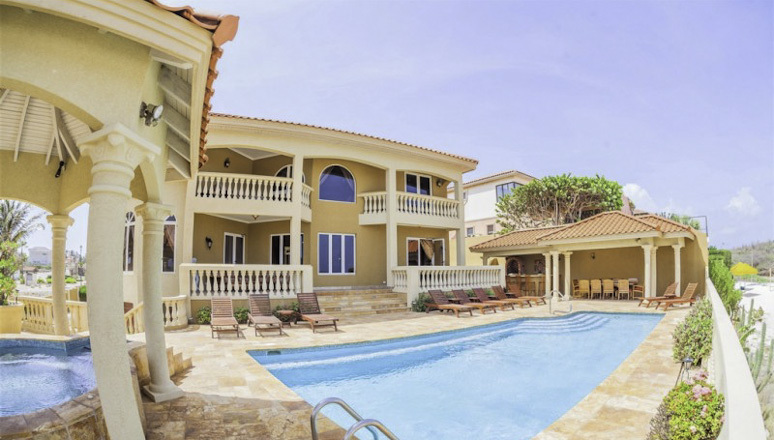 But first, let’s take a look at what makes Aruba such a world-class destination as well, as viewing some of the spectacular and luxury Aruba villas that we can offer. The origin of place names tells us a great deal about what to expect from a destination. Aruba is no exception. It derives its name from either old Indian or Spanish words that mean, “Well Placed”, “There was Gold”, or “Shell Island”. Whichever you prefer, you can be sure that this island is a wonderfully located, beach comber’s paradise …. and, newsflash, the “gold” is still there. You won’t have to look very far to find it! Going Dutch – in Style! Aruba is part of what is known as the Dutch Caribbean. It is an island paradise located a 2.5-hour flight from Miami. Sitting in temperate splendour only 15 miles north of the Venezuelan coast, it is one of the constituent countries of the Kingdom of The Netherlands. When you touch down on this island you are stepping onto a distant outpost of Holland. Dutch is one of the official languages, the Aruban Florin is the currency, there are Dutch architectural gems waiting in the capital, Oranjestad – all of these elements combine to give you that unique Dutch vibe without having to travel to Europe. All of this Dutch-ness gives way though, to a very modern island where English and Spanish is widely spoken. The US dollar is accepted virtually everywhere. Aruba is an island that has embraced tourism but wisely expanded in ways that have retained the natural beauty of the island while keeping pace with contemporary standards. Travel guides refer to the Aruba beaches as 'blonde beaches'. Do blondes have more fun? My answer is a resounding 'yes'! Palm Beach is probably the most famous of the resort locations. With a long and graceful beach unfurling in front of some of the high-rise hotels on the island, this is a go-to destination for those who enjoy busy, buzzy beach life. With access to bars, restaurants and shops, Palm Beach can be a fun place to visit and hang out during the day. Then as evening draws in, you can mingle at the beach-fronted gardens of some of the hotels and sip a cocktail or two before retreating to the splendour of your private villa residence. If you want to dial down the party atmosphere and are staying, with little children, at one of the luxury villas in Aruba, then a trip to Baby Beach is a terrific alternative. The shallow gentle waters are a safe and relaxed place to potter about with your little beach bunnies. One of the “Ten Best Beaches in the World” according to Travel and Leisure magazine is Eagle Beach on the south coast of Aruba and near to Oranjestad. Another beach of blonde perfection awaits you here. There are some spectacular private villas for rent along this coastline. It’s a great place to swim, hire a jet ski or other water sports equipment. Lots of facilities along this beach mean you can dig in for the day and enjoy the amazing beauty of this coastline. With so many incredible beaches around Aruba that cater to snorkelling enthusiasts, windsurfers, divers and sunbathers, there is a beach to suit all individuals or groups. The island is small enough that you can plan a morning or afternoon at a beach of your choice and always be near enough to your divine private villa home to return for a lazy afternoon nap or early evening BBQ. A visit to the capital Oranjestad (Orange Town, named for King William I of The Netherlands – Known as William of Orange), is always a must. You will see some lovely example of Dutch Colonial architecture. Fort Zoutman is the oldest building on the island and along with its tower that was added a little later, is now home to the Historical Museum of Aruba. You will also be delighted by the traditional Dutch buildings that look like gingerbread houses made out of pastel ice cream. These structures have tiled roofs and all the pretty detailing that conjure up the styles of buildings found in most Dutch cities. Somehow, though, in Aruba with the bright sunshine dazzling the facades, they take on an almost fairy-tale perfection. These are one of the most photographed features of the capital. There is plenty to see and do in Oranjestad for a day. It’s also a great place to enjoy some ‘wine and dine’ time. Why not take in a gloriously casual dinner at Barefoot, Aruba – where you can enjoy some lovely seafood at a table on the beach. You are positively encouraged to arrive in flip flops so you can truly feel the sand beneath your feet. As you sip a delicious cocktail or two, you can be hypnotised by the relaxing sounds of the Caribbean. Wrecked – But in a Good Way! If you are a qualified diver or perhaps thinking of learning, Aruba is famous as one of the very best locations to visit on the globe especially if you want to enjoy some wreck diving. At varying depths, there are some interesting vessels from WWII that were scuttled. Even more impressive, are two aircraft that sit peacefully on the sandy sea floor just off the coast. In case you worry that these are tragic sites for the morbidly curious, the planes were purposely sunk to help create a reef. Whether you are an experienced or novice diver, there is something to be explored for everyone. An abundance of tropical fish and marine life will add colour and diversity to each dive. Hats off to Aruba for designating such a proportionally large area of its island to Arikok National Park. This wild and varying terrain, covering 18 percent of the island, offers hiking trails across the highest hills in Aruba that offer unimpeded views over most of the island. This Park has a desert beauty all of its own. We wholeheartedly recommend you get on one of the jeep safaris to really get to see the hidden gems in this Park. The rough terrain and a lack of signposts mean that self-guided trips might miss some of the real points of interest. The 4x4 jeep tours, take in the sights of the lighthouse, some of the famous National Park caves like Guadiriki, Fontein or Huliba and, what is the highlight of Aruba, the Natural Pool or Conchi. This refreshing saltwater pool, surrounded by massive rocks, is a naturally formed coastal feature on the north-eastern side of Aruba. The pool is sheltered from the wild sea, but pounding waves send spray over the rocks onto the swimmers’ heads below. There are terraces that have formed over time that make excellent launching pads. I simply loved this day out. This pool is worth the trek. Don’t forget your camera! Rather unusually, we are going to focus on what you won’t be getting in Aruba. First of all, due to the location of the island, it enjoys a very dry climate. The heavy or seasonal rain that can often time make certain Caribbean destinations undesirable is not experienced here. There is an all-round dry, warm climate with temperatures sitting in the 24 to 34-degree region. The water temperatures range from 26-29 degrees, so you are looking at fabulous conditions for being in or on the water, all year round. The high temperatures are very gently offset by the cooling trade winds. Never has nature and climate so happily been combined. There is a very small amount of rainfall each year but nothing significant that could put you off visiting the island. The second thing you are very likely not to have in Aruba is a hurricane. This island sits just south of the Caribbean Hurricane Corridor so you can plan your trip knowing that hurricane action on the island is rare. In fact, the last time a hurricane glanced past Aruba was in 2007, reaching only level 2 and causing minimal damage. All Caribbean destinations have their own special take on local cuisine. The jerks of Jamaica to the Conch fritters of Turks and Caicos. What Aruba offers to this buffet of taste is Keshi Yena. This is a large round ball of cheese stuffed with spicy meat. There is nothing quite like it, and it is yummy. In addition to this unique offering, you can expect a wide variety of fish and seafood dishes that borrow the spice and flavours of Asian influences. The Dutch settlers introduced some recipes from their Indonesian colonies that are now staples on many Aruban menus, for example, Satee – the well-known tasty skewered meat dish. If you want to escape a grizzly winter and bask inclement temperatures all year round, Aruba is the place for you. If you want to travel to an island paradise that has flair and flavour that harks back to its old European roots, then Aruba is for you. All year round, the crystal clear water, unravelling against limitless blonde beaches, invite and entice visitors who return again and again. At 69 square miles, you will find this divine island, tucked into the sheltering crook of the South American coastline, has beauty, nature, fun and relaxation wrapped up in a rather different Caribbean experience. Exceptional Villas has years of experience building unparalleled memories for our clients. If you are a multi-generational family, a group of friends, a romantic couple, we have the knowledge and flair to match the perfect Aruba villa to your needs. There are no details overlooked in delivering an experience of a lifetime. Your Aruba vacation is your time to unwind and play. We enjoy being part of the process that allows you to kick off your shoes and embrace days of carefree pleasure. Aruba awaits! Book your Aruba Luxury Villa today with Exceptional Villas, one of the world's most trusted villa specialists. Every booking comes with our complimentary vip concierge service. Prepare to be wooed by the Dutch queen of the Caribbean and experience some of the best vacation rentals Aruba has to offer.